Leaders of the French Muslim community boycotted a major event hosted by the country’s largest Jewish group, CRIF, after its leader said that young Muslims are behind “all violent acts” in France. 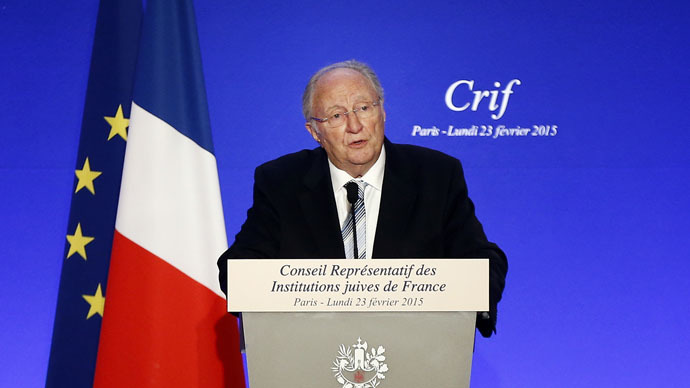 Roger Cukierman, president of Conseil Représentatif des Institutions juives de France (CRIF), made the controversial comments just hours before French President François Hollande was due to give a speech at the annual dinner hosted by the Jewish group. "All violence, and we must say this, all violent acts today are committed by young Muslims. Of course, that's a small minority of the Muslim community and the Muslims are the first victims," Cukierman told Europe 1 radio station on Monday. He also supported the use of the term “Islamo-fascism,” introduced by French Interior Minister Manuel Valls earlier this month. "I don't think Mr. Cukierman is someone who will contribute to us all living together peacefully," Abdallah Zekri, head of a CFCM department that deals with Islamophobic incidents, told BFMTV television. Cukierman attempted to backtrack on his statements, saying that he “deeply regretted” the absence of the Muslim group at the dinner. "Jews and Muslims are all in the same boat and I hope that contact will swiftly be re-established," he added. About 700 guests were present at the annual event. The row comes just over a month after a series of attacks by Islamist militants at the offices of French satirical newspaper Charlie Hebdo and a Paris kosher supermarket that claimed 17 lives.